I've been doing my fair share of hauling friends' bikes around for them when they need to get to the shop or break down on them. It kinda happens when you're the only one in the circle of friends that owns a truck (I'm just glad nobody is planning on moving soon). I've found, however, that no matter how tight you get the tie down straps, if you have a plastic bed liner, the front wheel will always slip a little side to side, which can cause some headaches down the road. I thought about installing a permanent wheel chock in the truck bed, but I don't want to have it in the way if I need to pick up some plywood, or anything else that might need to lay flat. That's why I've really enjoyed using one of these. 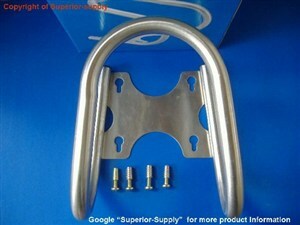 Superior Supply has a budget friendly wheel chock that is designed for both easy use and to last for a long time. The outside dimension is 9.8" wide, 11" long, and 10.5" high with the opening at 8" at its widest and 5" at the end. It's made out of solid stainless steel, so rust or paint peeling isn't going to be an issue here. Once attached, it is strong and won't budge, but it is easily detachable so when you don't need the chock taking up room in the back of your truck, you don't have to keep it there.